Confession time! Your correspondent stood on platform 3 at Newcastle Central Station chatting to Mary B waiting for a slightly delayed southbound train. Here it is. All aboard! Still chatting to Mary, the onboard announcement went, more or less, unheard. A while later: Tickets please! This train doesn’t stop at Durham, next stop Darlington. Long story short, Newcastle-Durham via the scenic route! The forecast was for torrential rain at some point during the afternoon. The outdoor stage down in Fowler’s Yard wasn’t the place to be exposed to the elements – rainwater and electrics don’t mix. The DJazz contingency plan was implemented. For Fowler’s Yard read TESTT Space. A disused office space above Durham Bus Station came to the rescue. Home to ‘creatives’ as they’re known, Empty Shop’s North Road satellite venue did the job. It’s a basic facility but at least it was dry. Chronotic Brass (Durham University students) first up. A good set apparently, your correspondent was en route from Darlington. 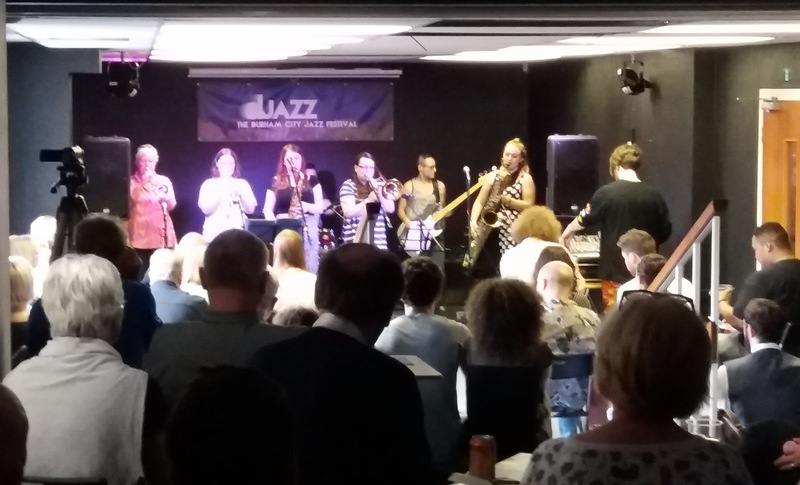 Break Out Brass Band - the all-female brass outfit (photo 1) was in full flow at TESTT Space - funked and grooved, mixing traditional New Orleans’ tunes (Crescent City) with the more contemporary sound of the Hypnotic Brass Band and the Youngbloods. Rob and Evie Sing! lept off Saturday’s page in the DJazz 2018 festival programme. Rob Singleton and Evie Hill are at the end of their first year as students at Durham University and they’ve become familiar faces – and voices! – at DU Jazz Soc jam sessions. 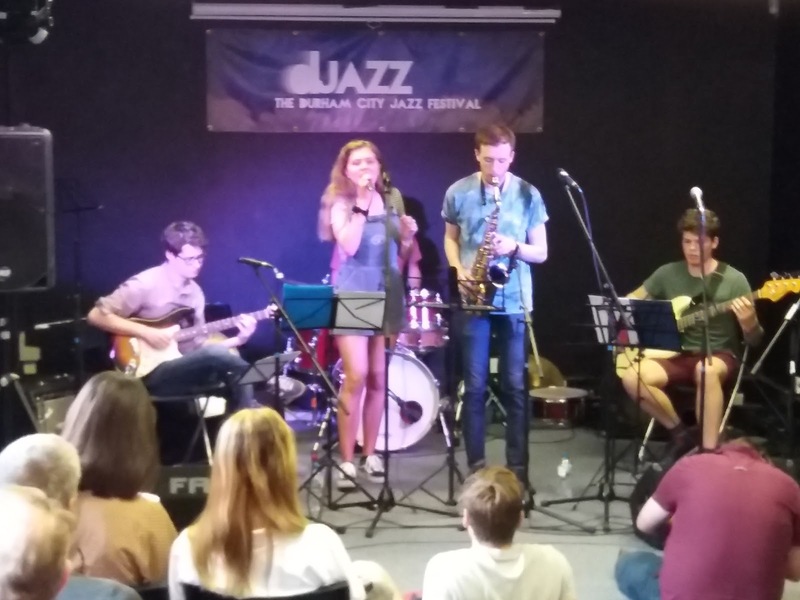 The duo kept it simple singing tunes in turn supported by some of DU Jazz Soc’s leading lights…Dan Garel (alto sax), award-winning Ollie Farley (guitar), uber cool bassist Dylan Purches and drummer Dan Sherington. Looking around the rather basic space, Evie pondered Isn’t It Romantic? Rob, carefree, suggested, with just a little Rat Pack swagger It’s Only a Paper Moon. And so they went; Evie…I’m in the Mood for Love, Rob…It Could Happen to You, Evie…I’m Glad There is You. 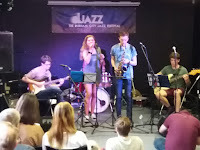 Altoist Dan Garel* has more than made his mark on the local scene – organiser, mover and shaker, and one great alto player – and his presence on the session offered reassurance to first years Rob and Evie. So too, guitarist Ollie Farley. The pair of them sharing the instrumental solo spotlight, Farley deservedly winning applause for a sensitive contribution on My Foolish Heart. *Dan Garel will shortly be moving on, he is soon to graduate. He’ll be a big miss. The good news is, at least for the next two or three years, Rob Singleton and Evie Hill will be around. Check them out.